Well, as I type this, people all around us are banging pots and pans and flashing lights from their apartments, cars are honking, people are shouting and whistling from somewhere, air horns are being blown. You may or may not have seen/heard something about this in the news, but here in Istanbul there have been days and days of anti-government protests. Unfortunately, I don’t feel like much of an authority on what’s going on, so I don’t really want to write much of an explanation or opinion. What I can say is that yesterday I walked to work at about 8am and the street where my school is was partially blocked off by a city bus and there were a few protesters out and about already. 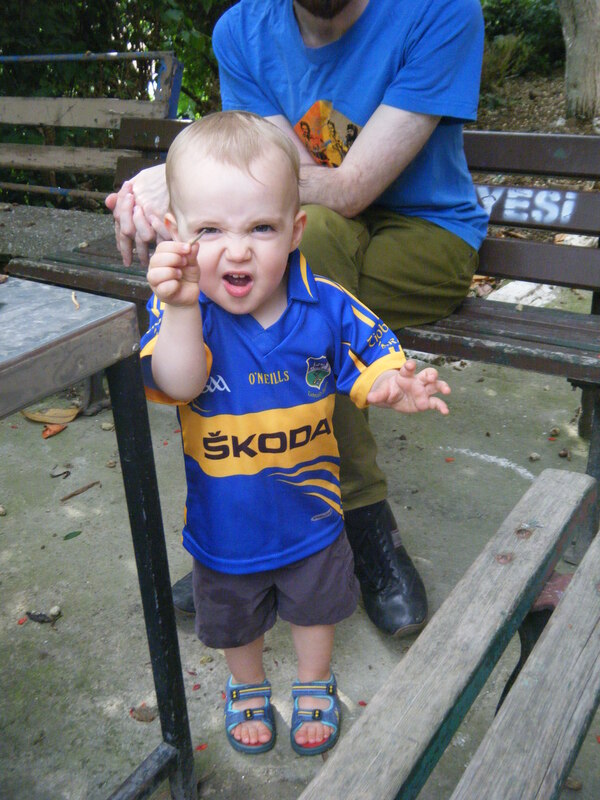 All the classes were cancelled for the day, due to the protest moving from the city centre and Taksim Square to Beşiktaş, so after a little bit of peppery tear-gas dissipated, I walked home to our nice quiet neighbourhood to spend a lovely day off with Richie and Liam. Anyway, that’s the very small bit of the action that I’ve seen. As an uninformed foreigner here I don’t feel like it’s my place to say anything else about it right now. So, protests and craziness aside, we have had a quiet and relaxing weekend. This morning was cloudy and showery and I was feeling pretty tired, so not much happened around here before nap time. This afternoon we spent some time in the garden, had a nice dinner and that’s about it. Unfortunately, Richie is still trying to get Liam to sleep, about an hour after bedtime. I think he was a bit wakeful, then there was all the noise of the 9:00 pot-banging-protest which kept him awake, so we brought him to the sitting room for a cuddle, and now Richie’s in there with him trying to get him settled down again. Sigh. Well, enough of this rather uninformative post! Here are a few photos! Liam got a package of lovely new summer clothes from his granny. 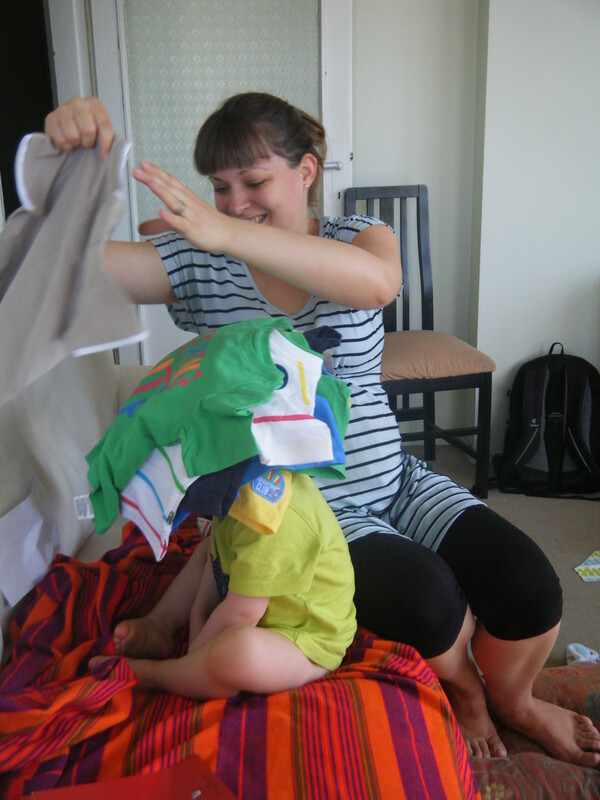 He wanted all of his shirts and shorts piled up on his head. He has a very unique fashion sense! 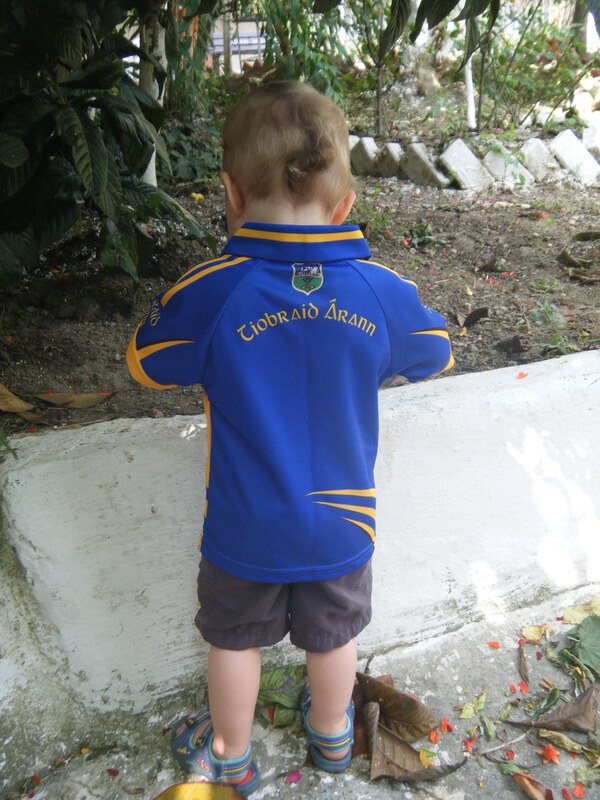 Our little Tipperary man in his cool GAA jersey! It looks like he’s going to attack me with the tiniest stick ever, but really he was just showing me and making a silly face. 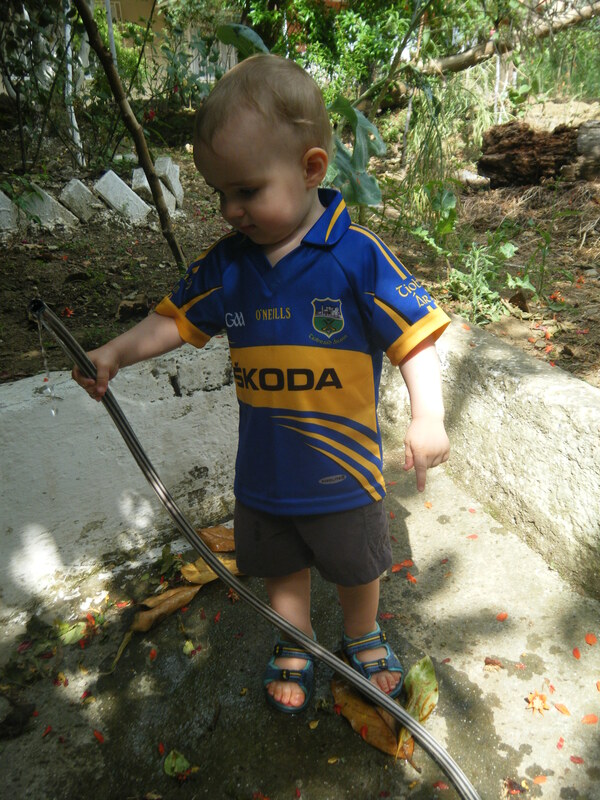 Mr Tipperary, playing with the hose again. This entry was posted in Around Istanbul, Liam. Bookmark the permalink. Yay! Keep the updates coming!